The Radley Fete and Flower Show are annual summer events held together at the Village Hall and playing field in Gooseacre each year on a Saturday in late June/early July. 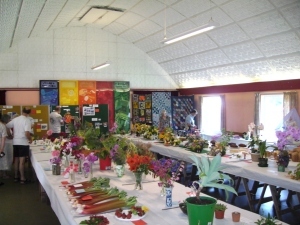 The Flower Show is an opportunity for villagers to show off their horticultural, culinary, artistic and handicraft skills in some 60-70 different classes. The next show is on Saturday 30th June 2018. A Special Class open to groups or individuals is a recent innovation. This sets a specific challenge which may vary from year to year. The challenge has been ‘Best Scarecrow’ since 2003 apart from 2004 when it was ‘Best Wizard’. The best entry wins a prize of £10 and the runner-up £5. Exhibits are open to viewing by the public during the afternoon of the Show. Winning produce from a number of the classes is auctioned off at the end of the proceedings to raise further funds, which mainly go towards defraying costs and providing prize monies. Cash prizes, paid for out of the entry fees, are awarded to winners. There are various coveted cups and trophies to be won. Awards of merit may also be conferred by the Judges.